EDIT: Giveaway is officially over. Congratulations to Tina Ivanisevic for submitting the randomly-chosen 471st entry. You will be emailed with instructions on how to claim your prize soon. The sea seems to stretch on forever, but I had no idea how big Renae's sunset necklace of the Pacific ocean was until it washed ashore into my jewelry collection on the east coast. Sure, the description of the oval pendant listing in her Mademoiselle Mermaid shop clearly read "approximately 40 x 30 mm" but I've never been good at visualizing measurements. Staring into her vibrant Santa Monica beach photograph, I could almost hear the waves crashing and the mermaids splashing. I was so impressed with the quality of her photo pendants that I asked her to make a limited edition jewelry run using my American mermaid art. Not only did she accept my offer, but together we are giving away the first mermaid necklace to celebrate the 4th of July! 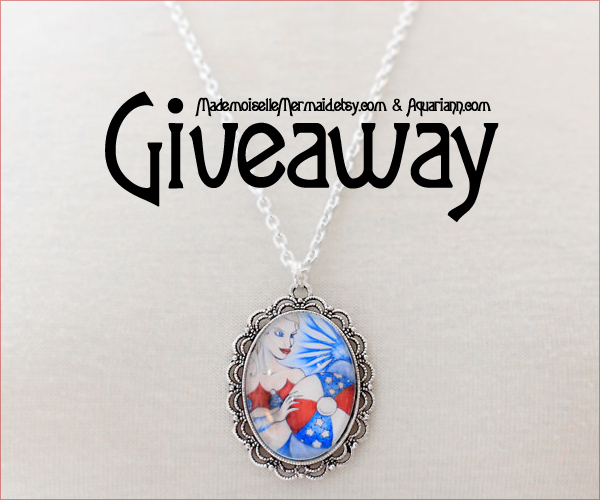 One lucky mermaid fan will win my patriotic print featured on an antiqued silver pendant. The exclusive art piece is strung from a 24" silver chain. Use the Rafflecopter below to enter to win worldwide giveaway before 11:59pm EST on July 5, 2015. Be sure that the mandatory comment on the blog post includes the same name you use to fill out the Rafflecopter - all entries by winner must be easily verified or a new winner will be chosen. Not including usernames when asked will also get you disqualified. I love the blonde fairy with blue butterfly wings. I like the Wolf Angel - Winged Wolf Art - Fridge Magnet. I love the unicorn warrior! I like the blue fairy but I do like the mermaid to.. These are beautiful works of art.. very magical thank you for letting me find her. I really like the Red Gerbera Daisy - thank you! I like the White Rabbit Art - Alice in Wonderland Drawing - Fridge Magnet. I like the green rose drawing. My favourite would be White Rabbit art magnet. I like the wolf angel magnet. i love the white rabbit! I like the Orange Tiger Lily and the Unicorn Warrior. My favorite item is Red Gerbera Daisy Art - Flower Magnet - Colored Pencil Drawing. I love the orange tiger lily art - the colours are gorgeous. Red Gerbera Daisy Art - Flower Magnet - Colored Pencil Drawing is the item I like. My favorite item would be the Wolf Angel - Winged Wolf Art - Fridge Magnet! it's soo cute, and my dog is part wolf. perfect fit! I also like the wolf angel. White Rabbit Art - Alice in Wonderland Drawing - Fridge Magnet I love this picture you've done so cute.